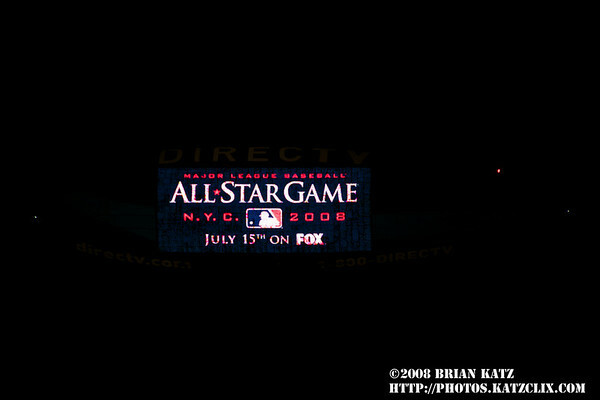 It's 3am......: All Star Game Take 3! My last post on the All Star game (Maybe). Yankee Stadium is a great stadium and what a place for the 15 inning pitcher's duel the other night. I surely thought that the National League was going to win the game when they carried the lead as late as they did and their pitchers were doing awesome. In all reality - both teams' pitchers were on. As the game wore on it became unbelievable. My brother and I looked at each other at the end of the tenth when the National League escaped the bases loaded with no outs jam and said at the same time - "Can you believe it?" We stay until the 13th inning and if I hadn't had to go to work early the next morning we would have stayed for the whole thing. We had a great view when Navarro was tagged out at the plate in extra innings and just didn't know if it was ever going to finish. It still leads to the debate of whether All Star Games should end in a tie but on the other hand, when I was growing up I don't remember every player who made the All Star Team playing. Should the manager try to play everyone or should he have pitchers pitch to more batters? Does it make sense to use your bench up early to middle of the game? Does it make sense to take out Manny Ramirez, A-Rod, Ichiro early with their track record with their bats?All questions I know I am not qualified to answer. Maybe I will let my friend Paul do a guest blog on this topic - he lives his life for baseball and can recite almost any stat (actually for his son Zach and the twins they are having). He has a deep passion for the game. So deep - he missed a foul ball at the All Star Game because he was keeping score in his program (didn't do him much good since the score sheet ended in the 10th inning. What an awesome game for my first MLB All Star Game ever!